A few years ago...I received a flutter of orders from Estonia. I thought I knew where that was...but did look it up....in the Baltic region of Northern Europe. Over the following 4-5 months I continued to receive orders from various groups for the same 2 or 3 prints, similar to the lovely T Red above. Once that line was gone...so were the orders. I came to realize that I had probably hit on the correct fabric design for their native costumes. The orders were from a variety of organizations...singers, re enactors, historians. Turkey Reds are a very colorfast version of Madder dyeing. The early designs were white motifs (either resist or later discharge) with an over print of black as a high light. In the 1820s a printer in Mulhouse developed a technique to add blue to the design. This plus the mineral dyes for yellow/orange gave him a new palette....Polychrome Turkey Reds! 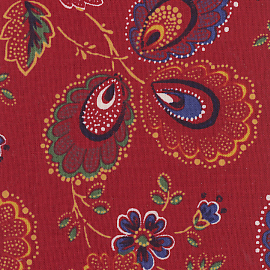 These fabrics, colorfast and lively, were popular throughout Europe and America. I am planning to begin posting some of my previous essays on historic fabric dyes and printing techniques. My goal is to publish, here at Cottonopia, my Textile History Crossword Puzzles! Prizes for a correctly completed puzzle will be Fabric!